unearthed from extinction: Swiss francs, lire. who stare from photographs, their wide eyes trying to figure you. graphite and charcoal, white. They are precious as coins. by somebody. Three separate sets of heirloom pearls. by post stamp, scribbled in archival pencil. smudges the pencil features of the girl. and charcoal sticks, oil pigments, brushes. expanse is where their glory hides. at the rustle of their wings. entombed below my heart—hepatic, dark. and let the myrtle grow. Its rich leaves lied. I can still see the heaving shovel's mark. naked figures fleeing from a burning structure. your green eyes lashless, your forearms bare. But the hillsides were still brimming spring. of stones, smooth and cool in a bather's fingers. the parched flowers, and mine is the ground. of propped windows. Curtains part. is blooming I can't get out. the dry wood creak of dory oars, the sun. and the cold writes its name on the land. it the sudden door leading her back into the dark. Chelsea Woodard's first collection, Vellum, was published by Able Muse Press in 2014 and was a finalist for the Able Muse Book Award. Her poems have appeared or are forthcoming in the Threepenny Review, Southwest Review, Blackbird, Poetry Daily, American Arts Quarterly, and elsewhere. She lives and teaches in New Hampshire. 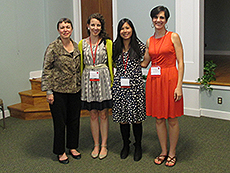 Jenna Le, Anne-Marie Thompson, and Chelsea Woodard join editor Kim Bridgford at the tenth-anniversary Mezzo Cammin panel at the Poetry by the Sea conference. Sophia Galifianakis was the recipient of the Mezzo Cammin scholarship. Corpus VI was formed in 2003, when six women figurative painters, who studied together at the Pennsylvania Academy of the Fine Arts, united to curate, exhibit and present our work to the public on our own terms, and launch our artistic careers. 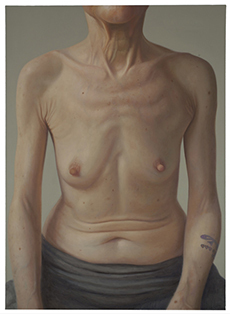 The name was chosen because it reflected our shared commitment to figurative representation. Clarity Haynes, Elena Peteva, and Suzanne Schireson were three of the founding members of the group, which organized an inaugural, self-titled show at Philadelphia's Highwire Gallery in the spring of 2005. The exhibition essay was written by Jeffrey Carr, Dean of the Pennsylvania Academy of the Fine Arts. The exhibition was very well-attended and reviewed in several art publications. The experience of working together to successfully realize this exhibition, as well as the continuous dialogue and exchange of ideas on contemporary figuration, has proven to be greatly valuable to us. Ten years after graduating from PAFA, as our careers have taken us to different locations across the United States, three of the original members, Clarity Haynes, Suzanne Schireson, and Elena Peteva, have come together to reinvent the collective by inviting one artist each to be part of this exhibition that will begin at the New Bedford Art Museum in fall 2015 and travel to other institutions. Holly Trostle Brigham, Stacy Latt Savage and Laurie Kaplowitz are professional figurative artists, whose strong artistic visions enrich the collective's range and explorations of contemporary representation. We are excited at the prospect of seeing our work all together in new configurations, creating new dialogues. Holly Brigham creates imaginative, narrative watercolors, which tell a feminist story, inserting her artistic persona into art historical narratives and mythologies. Laurie Kaplowitz uses textured paint to create personages that hint at the soul within, alluding to rituals of marking, scarring and adorning the body as an integral part of our human identity and presentation. Stacy Latt Savage combines figurative elements with fabricated structures and shapes to create objects that capture what it looks like to feel human and the complexities of our human condition. Clarity Haynes casts new light on ideas of beauty, femininity and embodiment through her realistic painted portraits of the female torso. Elena Peteva creates allegorical representations of our individual and social states through the human figure and subtle, charged, incomplete signs that invite the viewer's attempt for interpretation. Suzanne Schireson is influenced by her great-grandfather's autobiography as an early plastic surgeon and her paintings examine contradictions surrounding the birth of cosmetic surgery, such as the power to heal and the fostering of insecurity.